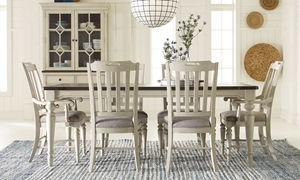 Two-tone table with reverse breakfront shape and four chairs with grey upholstered seats offer a trendy update on farmhouse style dining. 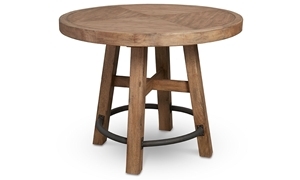 100-inch rustic trestle-style table surrounded by four ladderback side chairs and two arm chairs in a contrasting chalk finish. 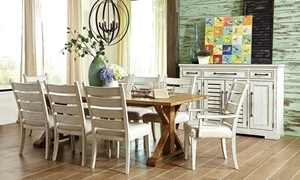 82-inch trestle table extends up to 100 inches accompanied by four cushioned ladderback chairs in a lighter chalk white finish. 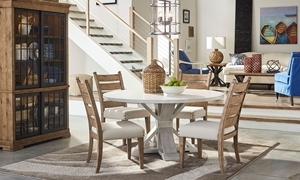 60-inch round pedestal table and four cushioned ladderback chairs in complementary distressed wheat and chalk white finishes. 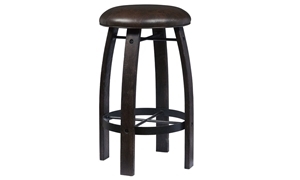 Set includes table with dramatic stepped edges along with four upholstered side chairs and two arm chairs, all with nickel-tipped feet. 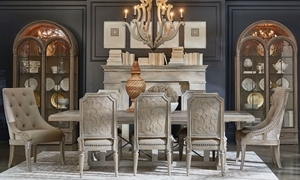 Neoclassical dining set includes 110-inch extension table, two tufted host chairs and four elegantly carved side chairs. 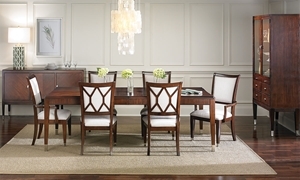 110-inch parquet top table with scroll pedestals accompanied by four chairs with carved filigree backs in a parchment finish. 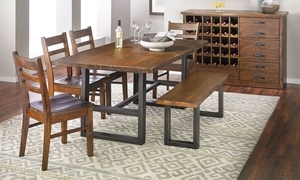 Add a rustic air to your dining room with the warm, weathered pine finish of this trestle table and four ladderback chairs. 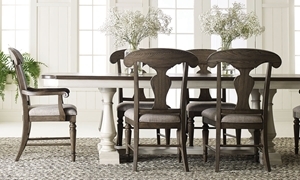 We have a stunning selection of dining sets for every home, so take the guess work out of decorating your dining room by choosing a full collection at Haynes Furniture.